The accessories of impact crusher are plate hammer, impact plate, side fender, square steel and compression block. In daily use, pay attention to the wear and maintenance of these accessories, the impact rock crusher can play the greatest effect. Plate hammer: Plate hammer is made of high manganese steel, processed into a cube, with no tension and crack. 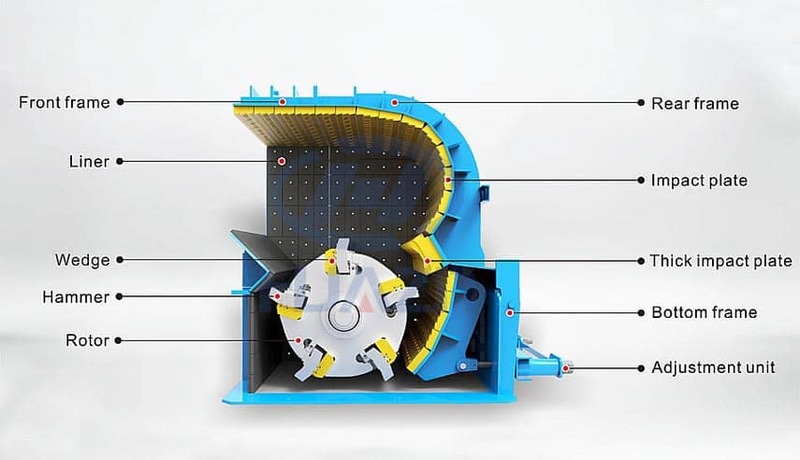 The wear degree and service life of the plate hammer are directly related to the material of the plate hammer, the ore hardness, the linear velocity (the circular velocity of the rotor), the structural form and other factors. Impact plate: The structure of the impact plate has a great influence on the crushing efficiency of the crusher. It is the key part of the crushing cavity, which has many forms, such as fold, arc, forward form and backward form. The structure of folded impact plate is simple, but it cannot guarantee the most effective impacting force on the ore. The circular arc impact plate is more commonly used in involute shape. This structural form is characterized by the vertical impact of the ore at each point of the impact plate, so the crushing efficiency is higher. Side fender: Side fender is an easily worn part of the impact crusher. If the side fender is aging and not replaced in time, it will easily cause a decline in strike-resistance ability. Thus causes the side fender to be shot down and other accident. Square steel: Square steel can be divided into seam and seamless two types. Seamed square steel is made of steel plates welded together to form square steel tubes. Seamless square steel is made from seamless steel tube. Its compressive strength is far greater than the seam square pipe. The square steel is used for do not let the materials discharging from the front. Compression block: Compression block using high quality material with stable performance, which can be made according to different requirements. After the completion of the load test run, the compression block shall be adjusted necessary. The automatic clamping mechanism of the compression block adopts the way of cylinder driving, connecting rod mechanism and linear guide rail to realize the clamping, feeding, clamping at the other end, loosening and returning in sequence. Next Article: What is Jaw Crusher?